On Saturday we’d headed to Hyperjapan. I’d been hoping to find some kawaii stuff for the nursery, as we’ve literally got nothing but didn’t see any housewares really. Not that that’s a problem really, as we’re not even halfway. Truth be told, I think I am waiting for the reassurance of the 20 week scan (Friday) before really starting to prepare for this bambino – and then I’ll probably choose some fabric and make some things rather than buy them. I am uber-excited about finding out whether we’re having a boy or a girl. We strongly suspect boy, I’ve always pictured myself with a girl though. So finding out this week will let us prepare, and get excited. I’m quite anxious to hear the heartbeat again, or see it. Over Skype with my mum today, I caught up on the news from SIL who’s due in April. They’re totally prepped of course. We got around to talking about my own birth, and she told me things that I’d probably heard before, but this time I paid attention. Mum went into hospital on her wedding anniversary, the 27th, as I was three weeks overdue, scheduled for an induction the next day. Dad was staying at my granny’s and went in to see her on the scheduled date, the 28th. The hospital reception told him that she had gone into the delivery suite and to come back in the afternoon. What had actually happened was, Mum woke up that day and had two breakfast options. (a) no breakfast (b) breakfast followed by an enema. She went hungry. Nurse did an examination and upon saying Mum was (she can’t remember) “however many” centimetres dilated (I’m guessing about 9.75) decided Mum had to go to the delivery suite immediately. She was wheeled downstairs on a gurney, and was greeted by the cleaning lady. It looks like I omitted some steps there, right? No, my mother didn’t have any labour, apparently. She certainly didn’t have any labour pains. I was just… there. She didn’t even get into the suite, I popped out as she was being wheeled down the corridor. She also reminded me that with my older brother, she got into a room in the emergency department in the hospital (at 1am after my granny, who drove her the forty-five minute journey because my dad was managing a night shift, banged on the door til the nurses opened up) and just about managed to slip off her Dr Scholl sandals and he arrived in the same manner. Oh yes, and thirty minutes later, she got up and went down the corridor to the payphone to call her mother’s house and announce that there was a daughter and my father should bloody well turn around and come back. In case you missed that, she walked down to call him. What has this led me to conclude? That I should fervently hope that in the same way that you can often expect to have the same experience of morning sickness as your mother, the birth experience also follows? That some women really do blink and ‘get a baby’? Well, yeah. I’d love to think that the first can happen, my mother seems to embody the second. But all in all it’s just made me hope to be even half as awesome as my mum. Homemade vanilla sugar. ‘Shame I forgot to put it into the cookie dough I was making though… Round 2, seconds away. If you’re free on the 31st of March, the next #foodbloggerslunch will be taking place at…. Ben’s Canteen. It’s at 140 St John’s Hill, SW11 1SL, apparently a short stroll from Clapham Junction, Northcote Road and Wandsworth Town. Cost: £25 per head (bargain!) Please bring the correct money in cash on the day, to make my life easier. In the email, please tell me how many places you’d like and the names of everyone in your party. Over half of the places have already gone to people on my mailing list*, and if you’re in, you’ll get an email by Monday letting you know. Dave has put together an absolutely cracking menu, which is below. – Beer gums, toffee apple lollipop, marshmallows and candyfloss cordial. 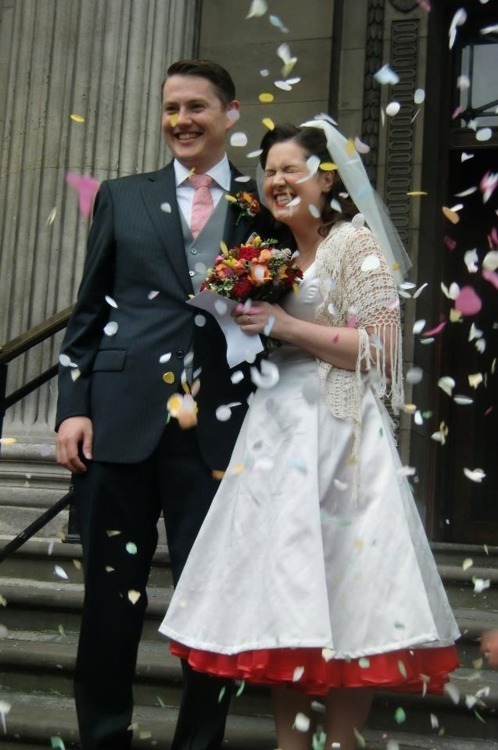 There were lots of good reasons for me to make my own wedding dress. I guess the main one was “I’ll be mad/sad if I don’t at least try” which sounds stupid but sums it all up. Now I’m mad/sad that I don’t have any photos where I’m not holding my bouquet like a shield. The bodice actually did sit flat, I didn’t need to disguise it. Contrary to the next picture. This was the first garment I’d sewed in about four years, I think. Looking back I’m surprised that I didn’t actually stop to think about that, but I guess that’s actually me down to a tee. The flip side was, if it worked out then I’d have exactly the dress I wanted, without spending a fortune. Burda 7569 looked pretty awful on the pattern envelope (sorry, Burda people) but totally worked with a petticoat. This was in the normal dresses section. Because we all wear satin, every day. I changed the neckline slightly and also chopped miles off the hemline. I’m 5’6” and this would have hit three-quarters of the way down my calves at literally the most unflattering possible point. I would have looked like an ambulatory iceberg. And obviously I ditched the ribbon doo-dad. I’ve never actually made up any Burda patterns before, I think I was scarred by memories of Home Economics and my teacher battering on about how they didn’t have seam allowance included and how that made them almost impossible. Firstly, that’s crap and now they do have all allowances included. Plus (and I really liked this) they number corresponding joins and points accordingly on different pattern pieces ie the tailor’s tack mark on the bodice and the mark on the skirt to which it should be aligned are both called 4, or whatever. Join 1 to 1, 2 to 2 etc. That’s really simple, and it’s helpful*. Deciding ‘that Vogue pattern neckline is perfect, now I just need to slap it on the fishtail from that Simplicity evening dress’ is probably going to be more trouble than it’s worth. If you’re accomplished enough to do that then you could probably draft your own pattern from scratch. If not, stay well away. If you see yourself in a long column dress, then a velvet or heavy satin could just pull the whole thing down and show every curve of your silhouette (which might be fabulously flattering, otherwise bring on the Spanx). Or a full fairytale cloud skirt may require lots of light tulle for the shape and then be unable to support that beaded lace overskirt you’ve seen in your dreams. If the pattern is a deal-breaker, commit to it and take it with you when fabric shopping. Discuss your options with the assistant at the fabric shop (always knowledgeable, often makers themselves). Don’t be afraid to browse at specialist shops and ask questions, even if you don’t end purchasing there. In the end, I went for a synthetic satin from John Lewis and it worked out about £65 for everything including the pattern, threads and zip (I think the red bodice lining may have come later and been another £10). Why not real satin? Well, I wanted splurge on having someone come to do my hair and make up on the day instead (no-brainer in my case and it was definitely the best decision for me). Also, I felt that this fabric draped really well and I really like the colour. 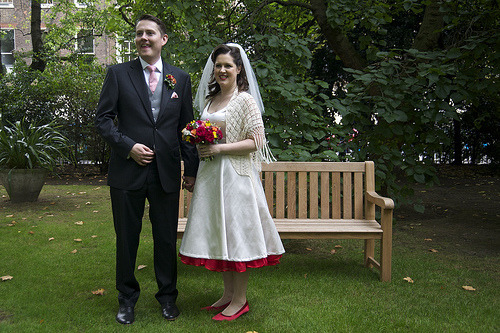 Being very very honest, how often am I going to wear my wedding dress again? My options are to dye it (possibly risky with synthetic fabric), embellish it or consign it to the dressing-up box if this baby is a daughter. For the sake of £65, I’m fine with that. When you are making your own dress, in case things don’t go entirely smoothly, or if you’re like me (bit rusty at sewing, fluctuating size, kind of making it up as I went along) you need to be relatively confident when playing with hundreds of pounds-worth of fabric. So maybe not the silk at £120 a metre (“Yes, you’ll need five metres” “Gulp”). That’s not to say that if I’d had more cash to play with I would necessarily have indulged in different fabrics or lace. I nearly bought some amazing lace when fabric shopping but it would have meant a different shape of dress entirely and in the end, I’m glad I found my pattern first and not the other way around. It also would have been in excess of £200 just for the lace, with the whole fabric budget about £400, and once you get into that territory I could have found a nice off-the-peg dress. Was so tempted to have a red dress. 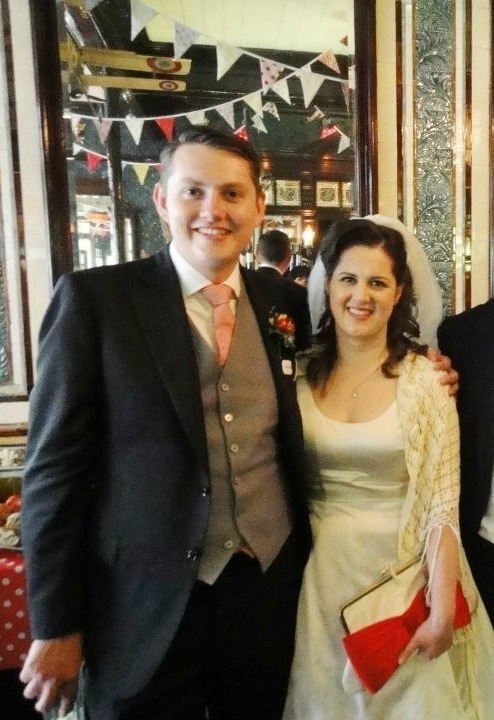 (Registry office wedding so no startling the vicar issues). In the end I went with what is optimistically called Oyster, and incorporated red into the details and accessories which was a good compromise. Hint: white is really really hard to wear. My bodice was lined in red, which nobody really saw but me but I was happy with it. Add at least an extra half metre to the pattern allowances. That should allow for last minute screw-ups and especially tweaks to very tailored sections – in case you need to cut the back bodice panels again because you forgot to add the seam allowances to your alterations, like (cough) someone I know… you’ll probably be able to use the surplus for accessories etc. If you don’t buy extra, be aware that you have little or no margin for error so be extra paranoid about ‘measure twice, cut once’; and that you’re unlikely to be able to buy the same fabric again. Unlike yarn, it doesn’t have colour shades and dye lots so the only way to ensure it will match exactly is to get it all from the same bolt at the same time. Whether by a specialist dry-cleaners for expensive stuff, or by chucking it in your washing machine if it allows, do it once to get any production residues out and minimize shrinkage during future cleaning. I also spent about £16 on a couple of metres of double-width sheeting and for the first time ever, cut a muslin. Because I’m way above the standard C cup to which most patterns are cut, I ended up with a very curious garment at this stage. This was also before I really got on the wedding diet in earnest. I cut the biggest size on the pattern. To accommodate my chest, I ended up keeping that size 20 front to the dress. The back worked out about a size 8 but somehow the underarms seams were exactly under my armpits which I still can’t quite figure out. Fortunately my pattern had a long zip all the way down the rear to below my hipline. I simply waited til I was near the end of the diet, pulled in the back to where it needed to be and did all the final alterations along the zip as if it was just a centre-back seam. The petticoat filled out the skirt shape too. I lost quite a bit of weight in relevant places hence needing to pull and tug the dress into a quite radically different size by the end. So I waited as long as I could (about 2-3 weeks before the wedding) before touching the actual fabric for the dress. I ended up changing the underwear I was going to wear after that, which is what you’re *not* supposed to do, but the new bra was actually much more flattering. But don’t do that, get your underwear ready for when you’re going to cut your fabric. 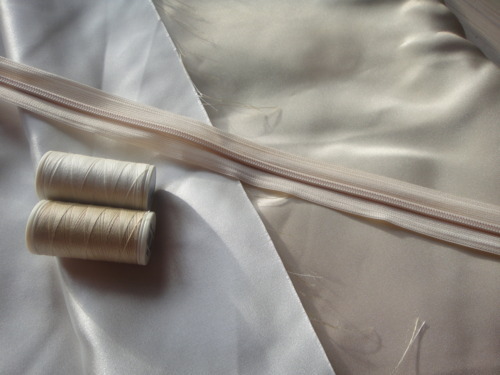 If you do make alterations, when you pin the muslin exactly to you, make sure you add on a seam allowance to the actual fabric before you cut it. I forgot on the back bodice panels and had to recut them but luckily had the spare fabric to do it. Ironically I then lost weight and realised the ‘mistake’ pieces would have been perfect. It was also both heavier than I expected which meant that it dragged down further than intended in a lot of photos, and scratchier. The woman I bought it from rhapsodised about how soft the fabric she used was – actually the tulle was attached to a band of cheap acetate lining on the top which had the potential to be a bit sweaty. She also used the most rubbish elastic in the waistband, thin knicker elastic that wasn’t really up to holding that weight of fabric and I did have terrors about it all ending up around my ankles at some point. I could have bought one from a local burlesque shop that would probably have been just as suitable and substantially less expensive. It was longer than I expected and by the time it arrived, I was too braindead to face raising the waistband and replacing the elastic, especially given that I finished hemming the dress at 1am on the Friday morning with the wedding on Saturday. In hindsight, I wish I had. I am pretty sure it was a bit wonky. 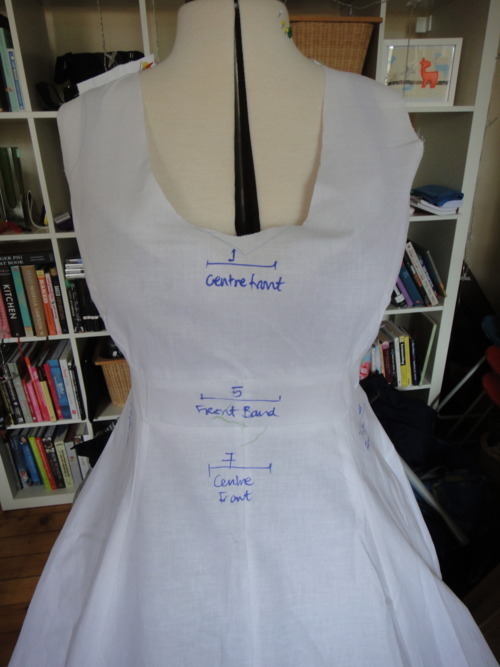 It’s not something you can do yourself – measuring a consistent length from the bodice is fine if you’re a perfectly aligned human. 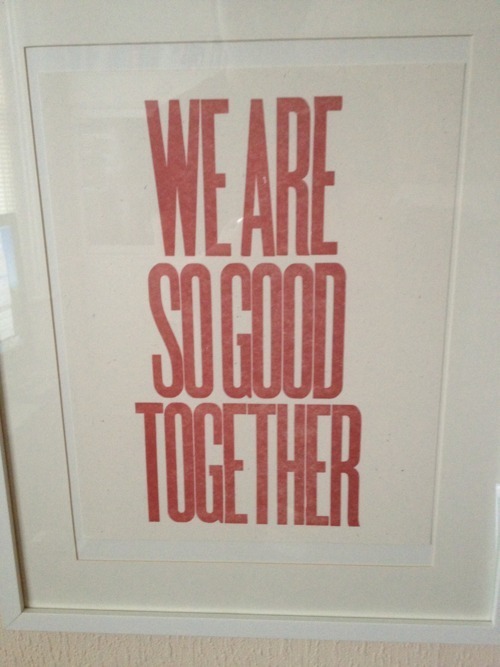 I am certainly not. In fact, enlist help with the whole thing. Not to necessarily hold your hand all the way through, but a friend who’ll help with measuring and marking alterations, as well as telling you not to panic, you’ll look great on the day, is invaluable. Treat it as a practice run. 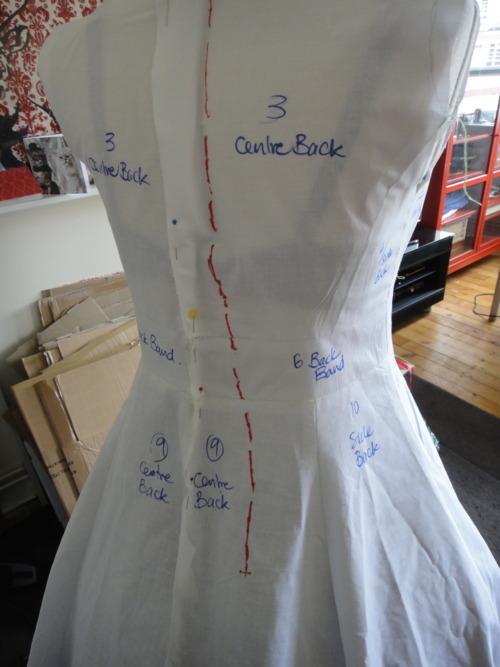 When I got to the making up stage, I had a few questions about the pattern that would have been solved had I actually sewn the muslin fully rather than just using it for sizing and roughly seamed it. Don’t: bother sewing the zip into the muslin. You’ll only have to unpick it and life’s a bit short, frankly. You can do just as good a job by tacking it, then pulling it with pins and a helpful volunteer. It can be a cheaper version but should be the same weight or you won’t be able to judge the drape and fall (if you have a local market, they can be great sources for fabric at £1-2 per metre). It’s time consuming and if you’ve got a huge wedding to plan, it’s a pretty big responsibility to take on. Would I dressmake again, for a big occasion? *My other favourite pet peeve? Why the hell don’t pattern manufacturers (particularly for multi-size patterns) mark somewhere on sheet where you can see it before you unfold the whole damn thing which pieces are on the particular sheet? It could be in the edge margin: “This sheet pieces 1, 3, 4 (8-12), 7 (10-14)” or whatever. Because we all know that once they’re unfolded, that tissue paper SWELLS like a pregnant woman’s ankles and is never going back in the envelope in the same way again. Hello Sunday morning. First elective cup of coffee in weeks.